We have many many cold days in this winter. On such a cold day, we want to eat something warm or hot. I would like to introduce one of Udon noodles dishes called Nabeyaki Udon. When I was a kid, I was glad if the lunch or dinner was Nabeyaki Udon. Because it will keep hot temperature longer than normal Udon noodles and has many ingredients. 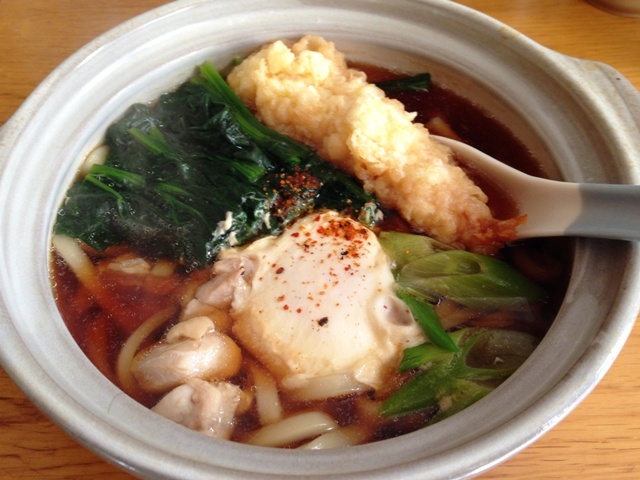 You can find Nabeyaki Udon at Soba or Udon shops. Mostly, it is served only for winter. It is a kind of seasonal Japanese foods in winter time. 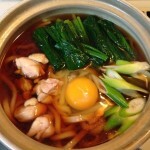 I translated it as Udon Hot Pot, but we have another hot pot style udon in Japan. It’s called Udon Suki. I want to introduce it, too in the future. 1) Cut the chicken as a bite size and Green Onion about 1cm width diagonally. 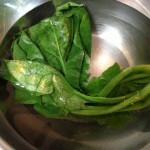 Boil the Spinach about 1 or 2 min. Then make it cold in the cols water, and squeeze it to remove moisture. 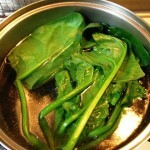 Cut the spinach about 3cm width. 2) Add Metsuyu and water in the earthenware pot and heat. 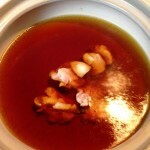 Once it is boiled, add the Chicken. Once the chicken is heated, pick up and place the dish. 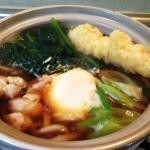 4) Place the Udon in the soup and add the chicken, spinach, green onion and drop the Egg. 6) Place the shrimp tempura on top. 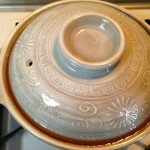 The earthenware pot is called “Donabe” in Japanese. So this food is called “Nabeyaki.” With using Donabe, soup will keep higher temperature longer. Therefore Nabeyaki Udon is hard to cool down. There are many size of Donabe in the market. Nabeyaki Udon is normally served with one for each person which has about 18cm diameter. We are using bigger size Donabe for other Nabe foods which cooks fish, meat and vegetables with broth. It’s very popular dinner at home in cold winter.